Ever been handed a 10 page product spec that no one wants to read? Ever write one yourself? Tired of struggling to communicate what needs built next to your designers and engineers so they really understand the who, what, when, where, why of the next feature you need? I’ve been using customer development, analytics, and information from my team to learn to build the right thing for years, but I always struggled communicating all the information locked in my head to the rest of the team. They needed to know why we were building it and all the necessary information to build the right thing without endless meetings or a massive spec they won’t read. Fortunately, when I joined KISSmetrics, Hiten and I got to learn a better way from Josh Elman, who worked on product teams at Twitter, Facebook, and Linkedin. Josh taught me about the Thesis, which is a lightweight way to communicate all the essential details your product team needs. Now that I’ve used the Thesis on dozens of projects and tweaked it based on what I found worked best, I’m going to teach you how to write your own thesis for the next feature or product you build. The biggest crime product managers can commit against their team and their profession is to make up answers to critical decisions. Don’t be that guy/gal. If you don’t know the answer to one of the sections in the Thesis, go find out. Dive into your analytics, talk to customers, run a survey, talk to your sales/account management/support teams that interact with customers regularly. You will gain the full respect of your designers and engineers if they know you always have a customer story and/or data to back up everything they may ask you about in the Thesis. The following are all sections of the Thesis. I literally use these as headings to break up the parts and try to keep each section to 5-10 bullet points or a few concise paragraphs. 1) Why are we working on this next? Every company, and especially startups, are resource constrained. What you choose to build affects your company’s bottom line, their standing in the market, and what your team thinks of your judgment. Use this area to concisely present your case for why this is the most important thing to work on right now. I try to have a mix of qualitative and quantitative data here. If a mandate came from the leadership team to focus on this area, or sales needed it for a big customer, I make sure to include that. The more your designers and engineers can understand why this matters, the more interested they will be in working on it. In the end, you’re a team and everyone on the product team wants to be sure they’re building the right thing. 2) What are the use cases for this? Most products end up having a variety of different users and ways that people use the product. To help your team better design a specific feature for the right part of your customer base, you need to detail who this new feature is for. On their way to work on the subway, content marketers like to check how their blog traffic is doing for items they published that morning or the day before. It helps them get into work and know how they’re doing before they sit down. If a number is low, they may try promoting it extra to try to raise the number. If the number is high, they may share the win with others on the team. Could you picture that situation in your mind? Can you see Jenn the marketer opening an app on her iPhone while sitting on a subway car? I bet you could. Your team can too and they can also then start thinking about what the perfect (not just good) solution would be for them. Write out as many use cases as you feel are needed. I often have as many as 4 or 5 detailed cases for a big feature. 3) What Problems do we need to solve? Features are really solutions to your customer’s problems. It doesn’t do any good to build a feature that doesn’t actually solve the problem, so it’s important to detail what problems you need to ensure the solution your team creates addresses them. Performance Problem: Customers are experiencing frequent crashes. This feature is critical for customers and they are constantly having to refresh and start over, losing their work in the process. New Problem: Customers spend hours manually copying numbers to a spreadsheet and making their own visuals for their VP. If we automatically make those reports, we’ll save them time and can then have the VP see our branded reports frequently. I usually write out 5-7 problems that a feature addresses in bullet form. If it only applies to some of the use cases I described, I’ll specify that as well. I also try to rank the problems, so that the most important issues get the most attention. Top problems may be because it affects the most people or functionality issues like the feature crashing constantly. When it’s time for tradeoffs when building the feature, having these detailed, ranked problems will help you make sure the right things avoid being descoped. 4) What are Future Considerations that must be accounted for? Products are always evolving. Startups can be unpredictable, but you still know generally the direction you may be heading, especially if you’re driving hard towards product-market fit. Help your team anticipate what’s coming next whenever you can. Balancing the present and the future is a constant struggle for a product. The best thing you can do for your team is give them the key information you know so they can do their best to balance their work against the present and future as well. 5) What is our KPI for this Thesis? You should ask yourself, “What would make this new feature a success?” A KPI (Key Performance Indicator) is the most common way to determine that success since ideally you will tie the success of the feature to one or more of your company’s key metrics. 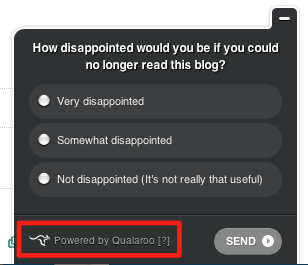 Support requests will drop by 90% for this feature after relaunch. Usage of the app will grow by at least 50% after relaunch. Because this feature affects the sign up flow, we expect a 5% lift in conversion after this relaunch. You will fail sometimes, but by forcing yourself to quantify what you expect to happen, you will keep you and your team honest. By setting a number that you must hit you can also know when you should go back and iterate. Your main document shouldn’t be longer than 2-3 pages, so Further Reading can act as an Appendix for you. In this section, I include links, screenshots, early mockups of ideas, markup of existing features for UX issues, and anything else that I believe would provide additional, helpful information and inspiration related to the project. Remember: You want all the detail you can without the fluff and verbosity that makes engineers and designers skip reading it. Further reading is a great place for specific information that didn’t fit in the above sections and may be relevant to specific team members. How does your team document what features need built next? You can have the best idea in the world, but until you find someone besides yourself that wants it, it’s not really a business. To find those people, as Paul Graham wrote in a recent essay, you have to “Do Things That Don’t Scale.” The problem is, it is often unclear what those “Things” are. Fortunately, the internet is full of help. 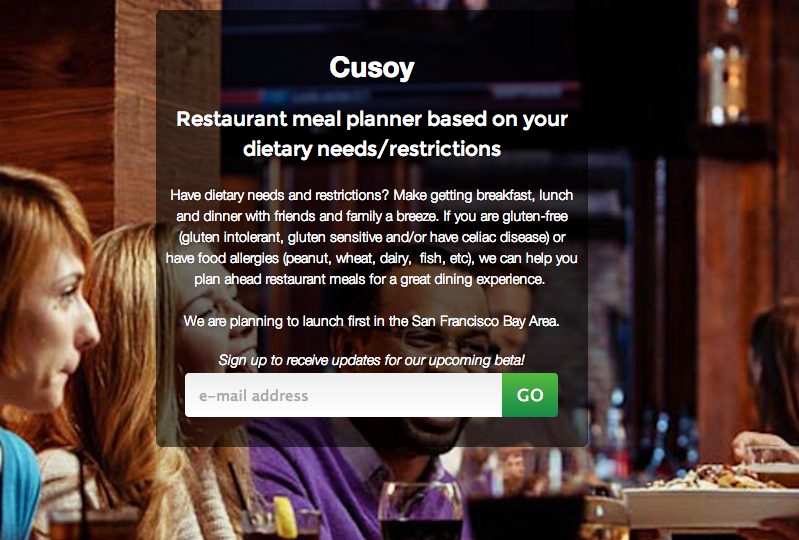 In particular, I was inspired by recent posts on someone going from zero to revenue in 5 weeks using customer development and validation by Melissa Tsang for her new startup Cusoy. I’ve also found the advice for Joel of Buffer about his start and the advice from this post by Jason Cohen of ASmartBear blog to be spot on. With all that advice though I still hadn’t seen anyone tell you where to look. Your initial goal should be learning. In the immortal words of Lean Godfather, Steve Blank, “No Plan Survives First Contact With Customers.” With that in mind, the last thing you want to do is be hard selling your idea to them. Instead, you want to interview your customers to understand their problems. You can learn how to do customer development interviews here. Understand you’re going to have a low success rate. There is no silver bullet for finding users for your startup, just tactics like the ones below that work to varying degrees depending on your idea and market. Even for good channels, a 10-20% response rate is normal, so don’t get discouraged. None of the ideas below are really scalable when taken literally. However, like Paul Graham said in his essay: don’t worry about scaling right now. Just do whatever it takes to find people and the scalable methods will emerge later. If you have a cofounder worried about scaling early, have them read the Paul Graham essay. Remember your manners and personalize. You’re likely asking people to talk to you when you have nothing but an idea and maybe a prototype of some sort. Be respectful in communicating with them. Also realize that no one likes a form note, so the more you personalize it and make it feel like they’re special, the better chance you have of a response. Elizabeth Yin of Launchbit has an awesome slideshare with advice on reaching out to customers effectively. If you abuse any of the tactics below, many of the sites and groups will ban or block you. Pay attention to restrictions to how often you can do certain things (like Meetup.com allows you to message 12 users per day). Realize the more times you break a terms of service, the more likely you are to get noticed and banned. On the flip side, it is easier to ask for forgiveness than permission. Just don’t be egregious. I’m writing a book on How to Build Customer Driven Products. You can sign up for updates and early access to chapters that will help you build product customers will love by signing up here. 1) Use Linkedin Answers: Look for people asking questions around your problem and market or ask your own. 2) Join Linkedin Groups: Join Linkedin Groups for your target market. Engage in discussions there, reach out to people that post relevant ideas or questions, or post looking for help. 3) Use Search + InMail: If you know the kind of person you want to talk to, try searching for them (like VP Marketing at companies between 25-200 employees) and using InMail to message them. 4) Check your existing connections: People change careers a lot more than you may expect. You may have also lost touch with an old classmate that is now in just the right market. Either way, your existing connects are very likely to respond and you’ll have access to their email address, which is better than their LinkedIn inbox. 5) Ask your connections for intros: It’s quite possible the perfect people to talk to aren’t already a connection, but they may be one degree away. Don’t be afraid to ask connections you have a good relationship with for an intro. 6) Post to the Linkedin Social Network: Linkedin now has status updates you can post. It’s a lot less active than other networks, but it can’t hurt to see if anyone notices. 7) Run Linkedin Ads: Linkedin is the network for professionals and their careers. If your startup idea has them as the target customer (say marketers or executives), then an alternative to the high maintenance of Linkedin Groups can be to run ads. Linkedin also has a partner network for a lot of business content sites which can further the reach. There’s a great guide on KISSmetrics for Linkedin Ads here. 8) Look up your friends: For most people, their closest people in their life now and in the past are on Facebook. If you haven’t already exhausted your existing network on Linkedin, definitely look to see if any of your friends are in the market and worth talking to. 9) Ask your friends: There’s also a lot of random people you met in college and other times. You never know who knows who so you have to ask. I just got introduced to another person in tech through someone I was in a beirut league with in college. 10) Look for Fan Pages: There’s fan pages for just about anything you can think of. People that run those pages in your market are great people to talk to both as potential customers and to see if they’ll post something on your behalf on their page. Friends who have leveraged this have found it cheaper than Facebook ads, even when they pay the Fan Page owner. Just click the “message” button on the fan page. 11) Run Targeted Facebook Ads: If you think you really know your audience demographics, then running a small set of Facebook ads to a landing page, can be a great way to garner interest. 12) Try the new Graph Search: I haven’t had a lot of success using it, but it’s worth searching for things related to your market to see if anything else turns up, especially now that you can message people you aren’t friends with. In particular, Facebook has a great geographic filtering ability you won’t find on Twitter or otherwise. 13) Ask your followers: If you have any kind of follower base at all, you should definitely tweet about who you want to talk to. If you don’t have a big follower base, ask the people with bigger followings you’re friends with to ReTweet you. As you develop your idea, you may want to tweet different requests, which may be seen by different people since no one sees every tweet of their followers. 14) Ask your followers for referrals: It’s not just about who you know. The bigger benefit is who your network knows so be sure to not just ask people you follow or follow you if they’re a fit, but ask others for referrals. 15) Run Twitter Ads: Twitter ads can be a cheap way to reach people you’d never know otherwise. We got thousands of sign ups for MyAnalytics App at KISSmetrics using them. Like any channel, the more mature it gets, the more expensive it will become, so by 2015, this may not be nearly as economical (like many Adwords today). 16) Ask Twitter Accounts to tweet on your behalf: Just like you can ask Fan Pages on Facebook to talk about you, you can reach out to Twitter accounts in your target market to see if they’ll tweet something for you or ReTweet you. If it makes sense for your business, you can also ask some celebrities via tools like BuySellAds and Sponsored Tweets. 18) Join a Twitter Chat: Many groups have regular chats that can be found based on the group’s hashtag they use. A great example is the Community Manager chat, #cmgrchat. This is a great way to ask questions and engage your target audience if they’re holding Twitter chats. 19) Search Twitter for People Talking about your Problem: Remember that time you were really annoyed at a company? What did you probably do? You tweeted about it. Try searching different ways for people talking about frustrations and you’re bound to find people happy to talk because they’re excited someone is going to make things better. I’ve successfully used this to talk to people about, of all things, email migration. 20) Email relevant friends/contacts: There’s a right way and wrong way to do this. Yes, you can spam all your contacts in one big dump asking for help. What will yield a better result is if you invest the time to be more targeted in who you reach out to. Close friends and family won’t mind and those actually related to your target industry. 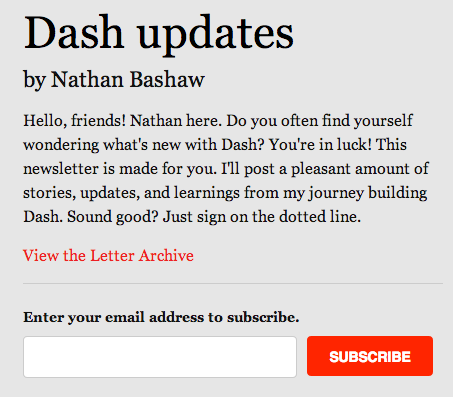 21) Start a personal newsletter: I’ve known some people to start a personal newsletter to have their contacts *opt into* that then regularly updates them on your startup journey and can ask for specific help then repeatedly in the newsletter. This works great for getting mentors and early supporters engage in a small ask (just opt in) and later help more as you have different needs. 22) Use Rapportive to find emails & cold email: Somehow you may have stumbled upon someone you’d *love* to talk to, but you don’t know them. 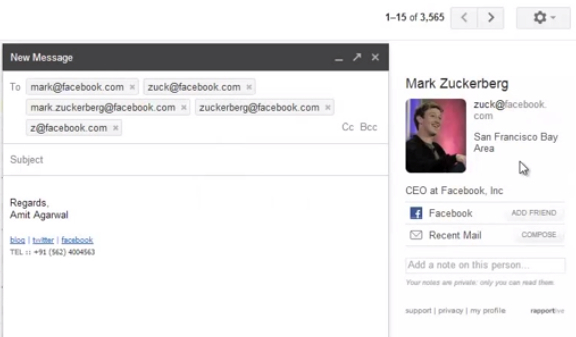 You can use tools like Rapportive to guess the email address and send them a personal note asking to speak with them about what you’re working on. You can find more advice on this tactic here and here. 23) Make your GChat status a call for help/intros: This may seem simple and passive, but you’d be surprised who reads your GChat statuses. Adding a note of what you’re looking for and leave it up for a few days and you might just get a few people to help you out. This works for other chat tools as well, of course. 24) Make your signature a call for help/intros: Just like your GChat status is a long tail way to get people’s attention, you can use your email signature the same way. Below your name in your signature is the perfect place to let people know. Don’t forget to update your mobile app’s signature as well as your computer’s. 25) Join & Attend Meetups in your category: Meetup has become an amazing hub of groups around just about any topic you can think of. 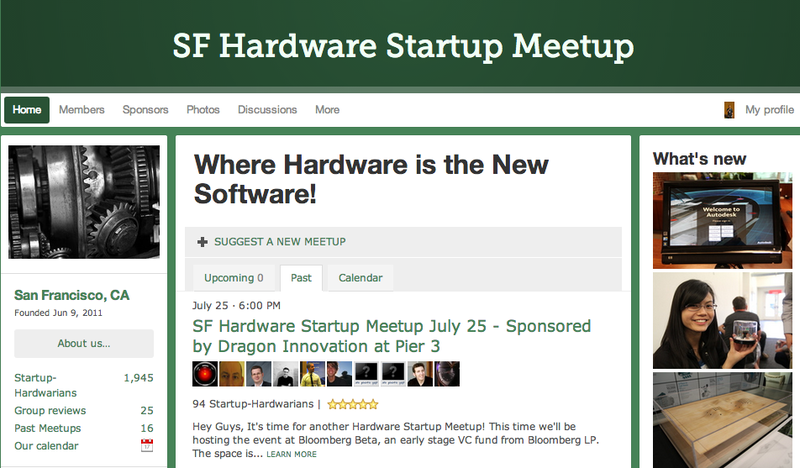 Whether you’re making an app for LARPers or a hardware startup, there’s a meetup group likely in your area you should join to meet and talk with group members in your target market. 26) Ask organizers to message the group: Organizers have unique privileges to send messages to their groups. You don’t get what you don’t ask for, so don’t be afraid to reach out to group organizers to talk to them (they may be a great target user) and see if they’ll message the group. They often make no money in running their groups, so you can think of them like the Facebook Fan Page owners previously mentioned. 27) Ask the organizer to allow you to address the audience at a Meetup: Potentially even better than getting into everyone’s cluttered inbox is the opportunity to address the whole group at one of their events. This allows people most interested to immediately approach you. This can be a great consolation ask if they don’t want to message their whole group since this requires no work on their part. 28) Mention in your Meetup profile what you’re looking for: Like the GChat status, this is a passive move that alone won’t get you everyone to talk to, but you’d be surprised how often people read the profiles of other new members in a group. Be sure to include your desired contact method if you want Meetup members to reach out to you. 29) Message users on Meetup.com: Not every member of a Meetup group attends every event and if there’s no upcoming meetups or it’s a group outside your area, you can still reach users by sending them individual messages. Per a great write up by Melissa Tsang, Meetup has a limit of 12 messages per day, which is still enough to get some quality responses as she writes in detail about. 30) Create a Meetup group: Just because a group doesn’t exist, does not mean there would not be interest. Countless people have launched successful businesses based on the idea of organizing a high value group. Just remember that if you do this, not only will you build trust and relationships with all the attendees, you’ll be the organizer who can send all those messages, decide who addresses the audience, etc. 31) Write a blog post about the problem you’re solving: If you feel you know some of the key problems that users are facing in your target market, write about it! If it resonates with them, they will share, upvote, tweet, etc it and some will even sign up as long as you remember to have a call to action to sign up at the end. You can see an example here, where 1,000 reads turned into 10 sign ups and a look at some famous companies that started with a blog here. 32) Post your blog to discussion sites in appropriate categories: Sites like Reddit and HackerNews are awesome to access established audiences for your market. Before posting, do your homework so you actually post it somewhere it’s welcome; a baker would not be well served to post their baking innovation on HackerNews, but a marketing startup would do very well posting to Inbound.org. By posting it to these sites you’ll significantly increase the reach of #31 and might also get some interesting commenters there you can reach out to like this example from Vero. 33) Update your About Page for what you’re looking for: Just like #23 and #28, it is always beneficial to list what your looking for on your About page. The most engaged people on your blog are likely to click to your about page to see who you are and if they see this, they can help even if they don’t read your specific blog post about your idea. 34) Make a page on your blog just about your market: Depending on your blogging platform, this could be easy or hard, but it can never hurt to organize your information in a way that people can easily navigate it. If you’re writing a whole series of items or have already created a lot of related content, this can be a great way to assert your expertise and act as a honeypot to draw in interested potential customers. 35) Start a blog just to talk about your industry: Don’t already have a blog or don’t want to talk about your startup on your existing blog? Then start a new one. It helps to have more content than just one post, so if you go this route, try to have a few posts you can post over a few weeks. 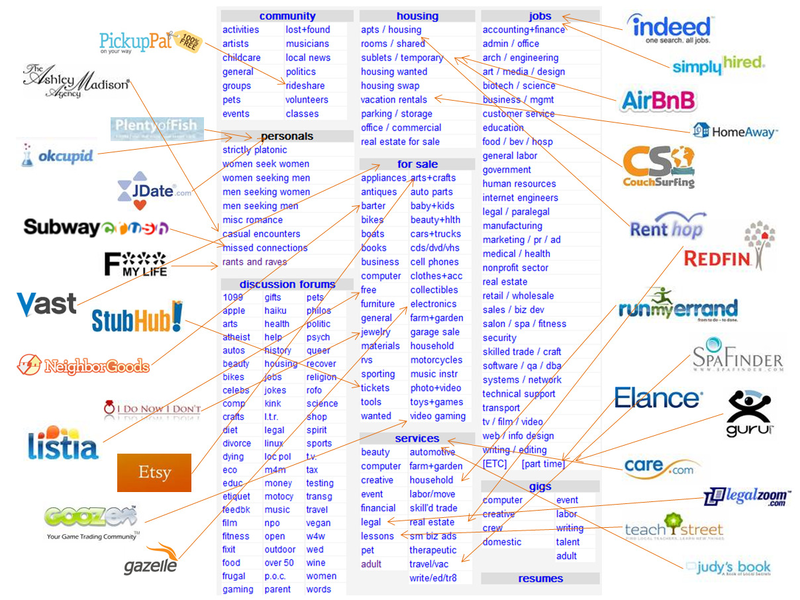 If you know your startup’s domain, you can make this the start of your company’s blog. Especially for blogs like this, try to get users to either sign up for an email list or to explicitly sign up for customer interviews. 36) Reach out to other bloggers for interviews: Chances are, there are other people writing about the market and potentially even the problem you’re interested in solving. These people are generally very knowledgable on the market and so they make great customer interview candidates and can also shed a light on more places to look for people in your market. 37) Ask other bloggers to run an ad for you: Many bloggers, like those fan page owners, don’t make a lot of money, so they may be willing to run an ad for you for very cheap or mention you in a relevant post just because they’re nice or like you. 38) Ask other bloggers to write about you: Going beyond an ad (which may be seen on multiple posts) you can see if a blogger is willing to write a whole post about you. If you’ve already interviewed them and they’re excited about your idea, this may be an easier ask than you think (and thus do it for free). 39) Ask to write a guest blog post: If your own blog has no audience, the best thing you can do is get a post you’d write on your market/problem on a blog that does have your desired audience. Bloggers love having more content to share, so if it’s a good post, they’re very likely to be willing to publish it. Look for guidelines and advice on guest blogging on sites you want to write for like on KISSmetrics’s blog. 40) Use Blog lists to find the right blogs: Not sure who to reach out to? Sites like Technorati, Blog Catalog and AllTop are great for finding out top blogs for things like Top Fashion Blogs or just about any other category. 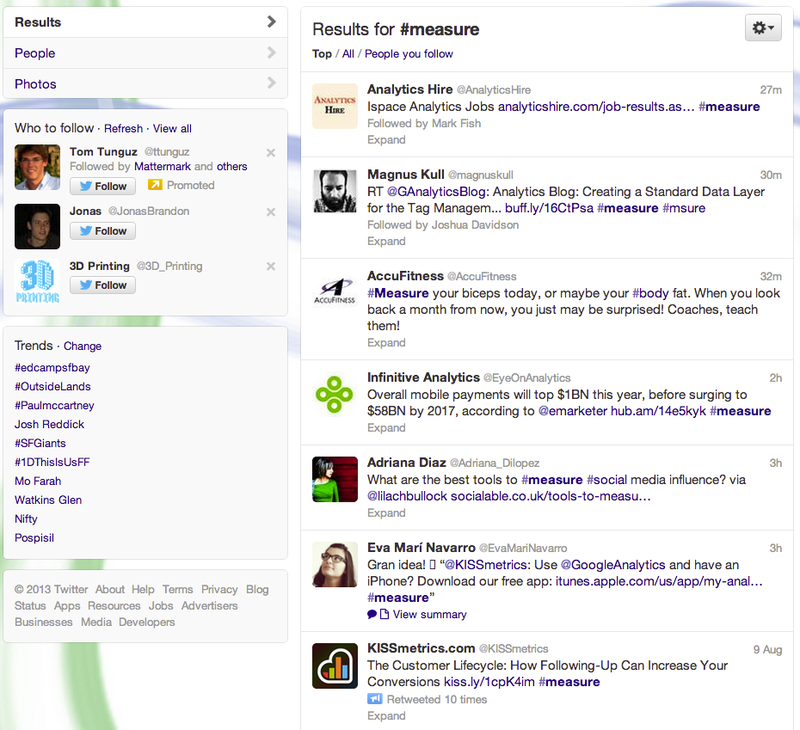 You can also look for other influencers on sites like Klout and PeerIndex. 41) Reach out to commenters: If you see passionate comments on someone else’s blog, follow the link and the profile/name from the comment to find out who they are and reach out to them. People usually will include a link back to their own blog, About.me profile or Twitter account from such a comment. This will give you a more direct, personal way to reach them, and avoid writing a bunch of comments, which the blog owner may then mark as spam and never be seen. 42) Reach out to people that ask relevant questions: If you can see who asked a good question related to the problem you’re solving, reach out to them using any methods the site allows to see if they’ll do an interview. 43) Answer questions about your problem/market: If you’re already knowledgable on your market, don’t be afraid to jump in and answer open questions. The people that ask can become great people to talk to and are more likely to be responsive if you already helped them with your answer. Don’t be afraid to drop a mention of what you’re working on right in the answers. Thomas Schranz at Blossom.io has done a great job of doing this in a helpful, non-spammy way. 45) Ask questions to see who answers: There’s no reason not to join the conversation by asking questions as well. Reach out to the authors of any answers you find satisfactory or interesting. The best part of asking your own questions is that virtually every Q&A site will send you alerts when your question gets answered so you can easily keep track of them even if you ask a few. 46) Put Calls to Action in your Profile and Answer Subheadings: Sites like Quora allow you to put whatever subheading you want below an answer, so don’t be afraid to mention something about your startup there. Also, like the other sections, always put in your profile what you’re up to so anyone that checks you out (even for answers you may have written in other areas) can find you and potentially reach out. 47) Approach people in native environments: Would your target customer be found in a coffee shop, grocery store or mall? Then go there and try talking to people. Like anything this is a skill. This can come off as harassing or creepy (and the store may ask you to leave) or it can work great. The founders of Sincerely have been know to walk over to a nearby mall and offer strangers money and app credits so they can see how a user uses their app. 48) Look for people unhappy with a service: Are you trying to make a real world activity (like finding a locksmith or a good mechanic) better? Then looking for disappointed people near that service may be just the unhappy customers you could delight with your service. After taking a bad cab ride, you’d be the perfect person to explain all the reasons you’d likely prefer to take an Uber next time. 49) Go to conferences for your target audience: Just about every industry has a few conferences related to it. Established businesses get booths, thought leaders speak and many deals get done. You should be there too as you’ll never find such a concentration of people in your industry. Take advantage of attendee lists to figure out who you want to meet with. Offer to volunteer or just ask for a discount ticket because you’re a startup and you’ll be surprised what you may get. 50) Go to trade organization events: Depending on the business you’re in there may be regularly “Chamber of Commerce” style events where your target customers may be. This would work especially well if you’re targeting people who own brick and mortar stores or provide contract services. 51) Go to places you know they’ll congregate: Have an idea for people that own boats? Then going to your local marina is a *great* place to find boaters to talk to. Golfers might just be at the golf course or driving range, frequent fliers at an airport and teachers at a school. Timing is obviously everything, so be cognizant of when someone looks like they’re approachable and have time to kill versus trying to hurry somewhere else. 52) Ask people on long train rides or airplanes: I’m always amazed by the kinds of people I meet when riding Amtrak or flying. Sometimes serendipity can work in crazy ways, so don’t be afraid to tell random people you meet what you’re working on. They might just be helpful or someone nearby will overhear and jump in. 53) Offer a user Referral Program: You need a great product before you should be trying to aggressively hack your growth, but that shouldn’t stop you from offering an incentive to your existing users to help you get more users. They likely know where to find more of them (their social graph, emailing friends, etc) so a little incentive will get them to help you out. There’s a great Quora thread on the subject here. 54) Ask your users via email: Especially in the early days, you should regularly talk to your users and be updating your whole user base regularly. As part of those updates for new features, major bug fixes and outreach, don’t be afraid to ask them for referrals to more users or people to talk to. 55) Always ask your users when you talk: Whether you’re doing a customer development interview, usability testing or just talking to a user about a support case, remember that you don’t get what you don’t ask for. Ask them both if they know anyone specific who might also be interested in your startup as well as places they generally find other people. The latter may turn out to be a meetup, a Twitter chat or something else that is very target rich for you, but you would never have known. 56) Look for relevant postings: Does your startup idea do anything that is relevant to one of the many Craigslist categories? Quite a few companies have had great success building a massive business off just 1 category (see below). Try reaching out to posters to talk to them and later you can potentially scale this. AirBnb is the most famous recent example, which Andrew Chen highlights well here. 57) Make your own post: Just like you can respond to posters, you can also make your own posting in the appropriate category and filter the ensuing responses to find the right people to talk to. A friend working on a startup recently used this to success by making a basic post and then sending all respondents a qualifying survey to make sure they were a match. A small cash incentive in the posting will generally drive a solid response rate. 58) Join in the conversations on the sites: Just about any community exists on the web today. Many of them are in places you would have no idea exists until you dig in. If you can’t find them initially, ask some of the early users you meet using some of the other tactics listed in this post. Once there, look around for people already talking about your problem you’re solving and join that conversation to learn more. 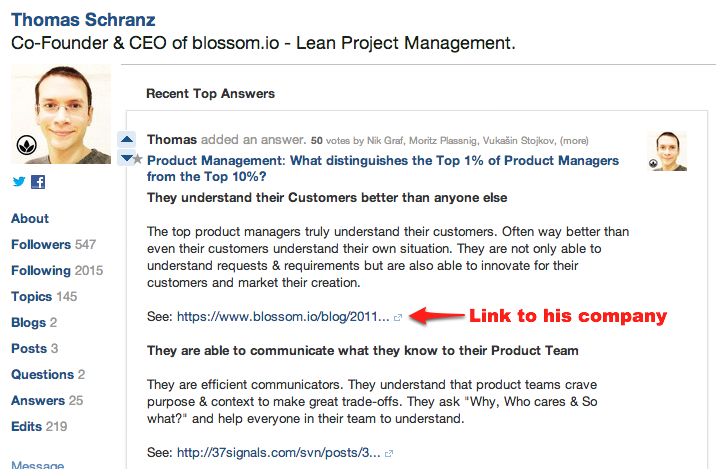 You can also post new discussions specifically on your target subject to see who is interested. 59) Message individual users of interest: If you see someone talking a lot about the problems or opportunities you’re working on, see if you can send a private message to them on the forum or at worst just reply to one of their comments asking to speak with them. Anyone sufficiently passionate will be excited to share their thoughts. 60) Reach out to moderators: If this is truly a community site (and not another company’s forums) then the moderators are often the most passionate people of all. Reach out to them as great people to talk to and learn from. As a moderator, they’ll be spending as much time as anyone following all the conversations there so they could provide valuable insight beyond their own experiences. If it is a company’s forum, then tread a bit more carefully depending on if your idea is competitive or complimentary. 61) Ask Moderators to post on your behalf or run an ad: Many forums on the web are run with very little revenue and more as a passion project. Therefore, much like some of the previously mentioned Fan Pages, etc, they may be open to posting on your behalf or running an ad for a very small fee. They’ll know the ins and outs of the site, which will give you a better chance of reaching the maximum audience. 62) Run Adwords with a landing page: An efficient (though at times costly) way to build an early user list is to run a quick, targeted Adwords campaign linking to a sign up landing page. You can learn how to set that up here. There’s also good advice on evaluating the success or failure of such a campaign here and here. Realize that paying to get a bunch of people on a list doesn’t validate much on its own. It’s then using that list to reach out to users and talk to them and ask them to pay for something that does. 63) Run ads on lesser known networks: Google may have the largest audience, but not the cheapest or best targeted. Consider your market and think about if other ad networks would work better. There’s everything to consider from Yahoo and Bing to mobile ad networks or blogger ad networks. You can find a list of alternatives here. 64) Have your SEO basics in order: What’s better than the perfect Adwords campaign? Showing up organically for searches on your problem. Great SEO takes time, but you can make sure to have the basics right from day 1 so that you can at least get a trickle of interested users to your blog or site. There are a lot of great tips on the KISSmetrics blog including this great SEO Guide for Beginners. 65) Talk to newsletter owners: Just like passionate people often run forums simply for the love of it, others will run newsletters. If you already subscribe to them, don’t be afraid to just reply to the newsletter and ask for a few minutes to talk to them. Most people are excited to hear from people who read their work! 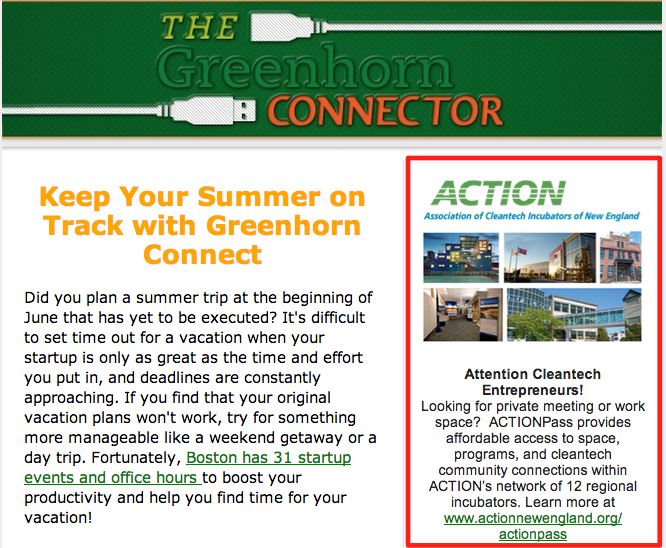 66) Buy Ads using a newsletter ad tool: There’s a great newsletter ad network called Launchbit. It can be a great help in both finding out what newsletters exist in a category and allowing you to quickly set up an ad campaign across multiple such newsletters. 67) Ask for mentions in a newsletter: In addition to talking to newsletter owners as potential early adopters, you can also ask them for exposure. Many newsletters have no formal advertising system like Launchbit, so often you can just go direct to them to ask for a mention for little or no cost. The more excited they are for what you’re doing, the less likely it will cost you anything. 68) Start your own industry newsletter: If you don’t find any newsletters in your category or are think there’s room for another one, then don’t be afraid to start your own! It will take time to build up an audience, but it’s a great way to put to work all those signups you’ve been driving to your landing page. Often times, it’s easier to first get people on a newsletter and then later convert them to a paying customer. 69) Reach out to complimentary startups: No matter your industry or idea, there will be others in the market you compliment. 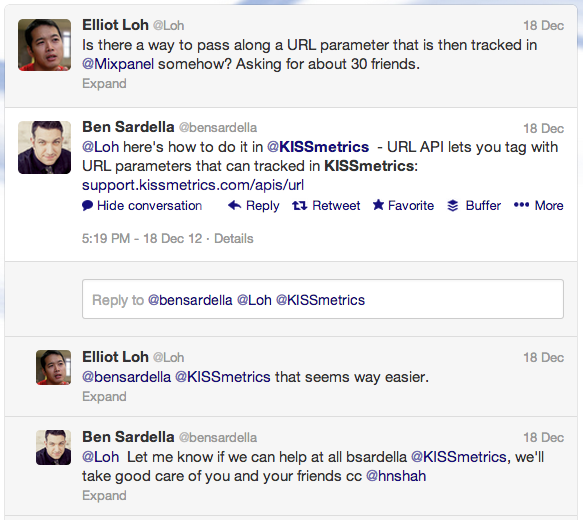 At KISSmetrics, there were many other SaaS tools we were happy to integrate with and swap customer/mailing lists. In most cases, our analytics was something their users needed and many of our customers could use a support tool, call tracking metrics or track a MailChimp email campaign. The best case for success with this method is to target companies of similar size (ie- mailing lists and user bases are of similar size) as that assures an equally mutually beneficial relationship. 70) Ask to guest post on their blog: Just like there are industry blogs run by volunteers and people just generally passionate about the space, there are also companies with prominent blogs. One of the biggest challenges they often have is having enough content. Reach out to someone on the marketing team or any contact info you see on the blog and propose topics that allow you to naturally link to what you’re doing. 71) Find their users and reach out to them directly: If you think your idea would be helpful to that company’s audience, look for people actively engaging and discussing the company on all the platforms I’ve been writing about throughout this post. While it’s better to ask for forgiveness than permission, remember again to use tact so as to not be spammy or offend the company. 72) Watch what they do: As the saying goes, “When in Rome, do as the Romans do.” Chances are your competition has figured out at least a couple of spots where your customers exist and you can enter the conversation there as well. In more modern terms, if something they do works, then consider Jobs’s favorite quote, “Great artists steal.” Like their Facebook page, and follow the company and key employees on Twitter for some inspiration based on what they link to. 73) Look for social mentions: Especially if you’re trying to disrupt a large incumbent, there’s likely many people talking about your competition. Look for especially people complaining about the product or experience. These are perfect people to reach out to learn from and hopefully convert to giving you a try. This also works for other startups you’re competing with. 74) Use research tools: Tools like MixRank, which shows the ads a site has been running, and Spyfu, which shows you the expected ad spend and keywords purchased for competition. If you’re looking for inspiration on the kinds of ads to try, those tools will help you get there. 75) Use Datanyze: This tool will tell you what apps any of the top 1,000,000+ websites are using as well as what they’ve recently quit. It’s transformed more than one sales team I know and provides priceless information on the state of just about any web SaaS market. Their free demo can help you understand market share, while the pricey version has alerts for specific tools and lets you see what any site is currently using. 76) Leverage tools that tell you contact info for key roles: If you know the persona of your target customer, then a list like Hoover’s or Jigsaw can help you find some of those types of users at especially bigger companies. Note that this lists they have aren’t 100% accurate, nor are they cheap. Try to hustle access via a friend or advisor. 77) Ask your professors: Many professors live vicariously through their students, and are happy to help out current students as well as alumni. If you had a professor that you had a particularly strong relationship with that is relevant to your startup, definitely reconnect with them. Also realize that many professors will talk to alumni who they never taught. Most professors have industry contacts they can help you with introductions as well as be a great channel to their students as potential customers or hires whether via emailing them or letting you address the class. 78) Leverage your alumni network: Whether it’s old clubs you belonged to, a fraternity or sorority or simply the alumni group for the city you’re in, you’d be amazed what people may be doing after school regardless of major or study habits. Don’t be afraid to both reach out to old classmates and club members as well as reach out to the clubs themselves for help from current members. Every student group I was in loved to hear from alumni. 79) Use your alumni directory: Many schools have searchable alumni directories that can allow you to track down contacts at some of the most powerful positions in the world. The shared experience of going to the same school is often all you need to mention to get someone who normally would be unreachable to suddenly be accessible to you for a meeting, mentorship or the right introduction. 80) Reach out to student groups: Even if you weren’t a member of the group, student groups are usually excited to hear from alumni. If any student group fits as a target customer for your startup, you should reach out to them. Playing the alumni card often gets you a great response and can often lead to offers to help you in many ways. They can email their list, let you address the group at a meeting or assist in recruiting help. 81) Post an offer in public places: Bulletin boards still physically exist in many places and people still put up physical signs for all kinds of things. The stereotype are things like meetings and guitar lessons, but that doesn’t mean you can’t get attention being creative. If you know there are places your target audience will go to or pass by, consider posting something to get their attention. If you’re doing a Concierge MVP for your idea, this is a great way to start. 82) Use handouts, fliers or mailers: If hanging something up and hoping people will read it and respond doesn’t work for you, consider a more 1 to 1 communication through handouts you can give out or mail. One person I met that had a parking ticket app would carry fliers with him and put their flier under the wiper of a car that already had a parking ticket on it as well. It had a massive conversion rate. Get creative! 83) Buy someone’s service: So you want to start a business serving artists, or maybe housecleaners or some other service? Try buying their service and take a few minutes before or after their service to talk to them. If they care about customer service, they’ll be happy to discuss their problems with you. A friend of mine started his mobile invoicing startup based on the problems his cleaning lady had tracking payments. 84) Look for products getting funded in your industry: Funding sites are booming which means all kinds of companies and ideas are getting funded. Others in your industry can be incredible sources of knowledge not just on how to run a campaign, but what they’ve learned from interacting with their new customers. 85) Ask complimentary funded projects for help: A fellow crowd-funded project that has finished their funding will be very busy trying to deliver their product to their supporters, but they might just be willing to send a message, tweet or post on your behalf. If their funding is still open, you may be able to swap promotion to your audience and theirs. Remember: You don’t get what you don’t ask for! 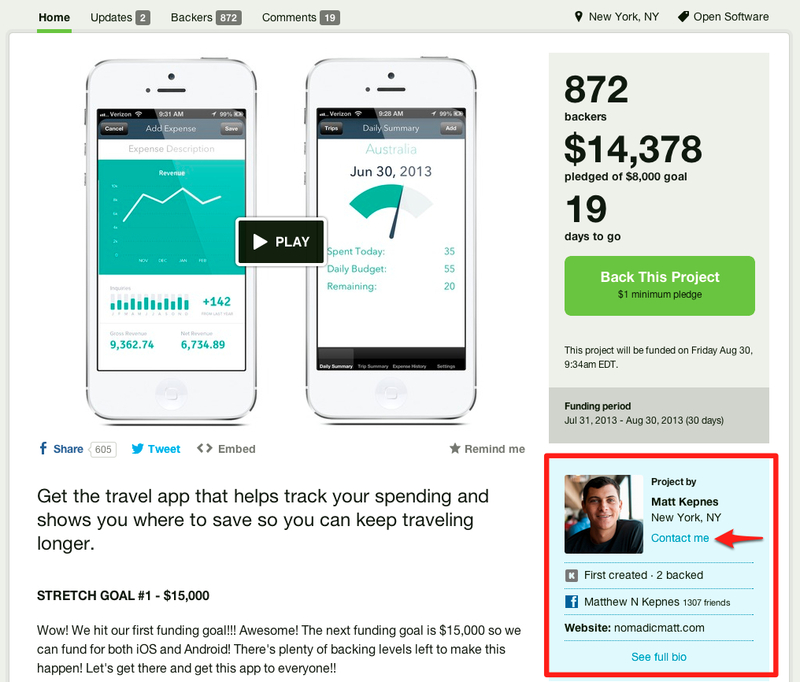 86) Reach out to users that backed the project: Every Kickstarter has a tab for Backers which includes their profiles, which you can click to see what else they’ve backed. While they have no messaging system (Indiegogo does), with their full names on Kickstarter, you can likely Google or search Twitter or Linkedin for them and message them there. 87) Put your idea on a funding site: If you feel you’ve validated your idea enough, then running your own crowd-funding campaign is a great way to validate interest for your idea. There is tons of information on the web about making the most of a campaign, just search on Google or Quora. 88) Talk to Youtube Channel owners: Youtube is filled with creators making content on all kinds of markets. 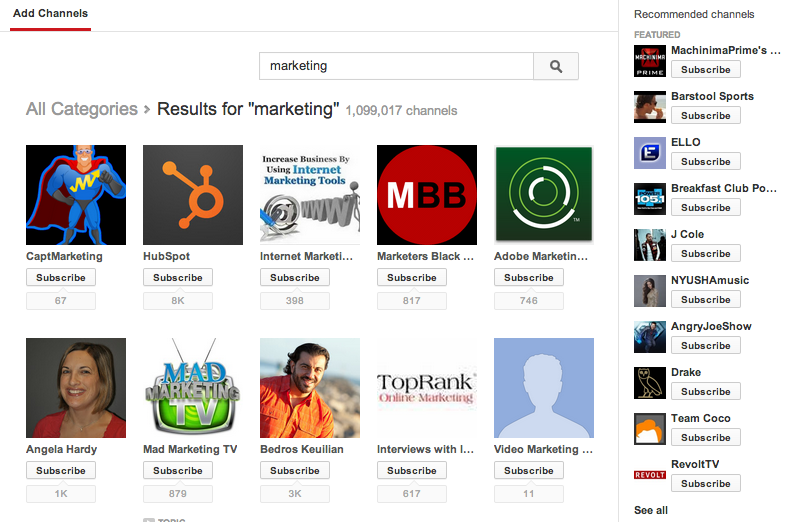 If you go to Youtube’s channel search, you can search for your category and see who has channels and how many subscribers they reach. Just like you can talk to bloggers as experts in a market, you can learn a lot by interviewing channel owners. 89) Ask channel owners for promotion: If your idea resonates with the channel owner, there’s a good chance you can get them to talk about you on one of their episodes or maybe even have you as a guest. They may charge you a fee, but if it’s your exact target audience, it might just be worth it. 90) Start your own channel: If you think video is a great medium to communicate with your audience then creating a channel to connect with them may be a great option. Just like starting your own Meetup group, it can initially be hard, but once you’ve built an audience it will have a great, long-term payoff. 91) Run ads on Youtube: Youtube leverages Google’s ad powers to run targeted ads. You only pay for the ads people fully watch (not skip) so if video seems a powerful way to communicate with your audience, it’s worth experimenting. Remember, Dropbox started with nothing but a video and got over 75,000 signups (although they did not run it as a video ad). 92) Put your name on it: If any part of your product can be seen by a non-customer, make sure your name is on it. This is easy, free marketing that your customers can provide for you simply in using your product. KISSinsights (now Qualaroo) had incredible growth without doing any paid advertising because of a simple link in each of their pop up surveys. 93) Make sharing an option for more access: If your product has metered usage, then you will always have customers who are uncomfortable moving up to a new, costlier tier. MixPanel has a free 50,000 events plan that can become a free 175,000 plan if you put their logo on your homepage. I’ve seen countless startups with that logo in their footer for just this reason, so don’t think your users won’t do it until you try. 94) Build a product “worth tweeting about”: In the rush to build MVPs and move fast, it can be easy to end up building a half assed product instead of half a product. If you instead solve a deep pain in a delightful way, people will naturally rave about it. Crashlytics, which was Twitter’s largest acquisition ever, used this strategy to experience viral growth of their app crash reporting tool. 95) Run ads in your side project apps: A number of my friends have built apps as side projects that end up having a few thousand users that never really monetized or amounted to anything. As a free user base you can always insert your own ads into your app. I met one of the founders at QBix that built the Groups App for the iPhone (helping you organize your contacts) and they used this tactic to drive people to their other apps. 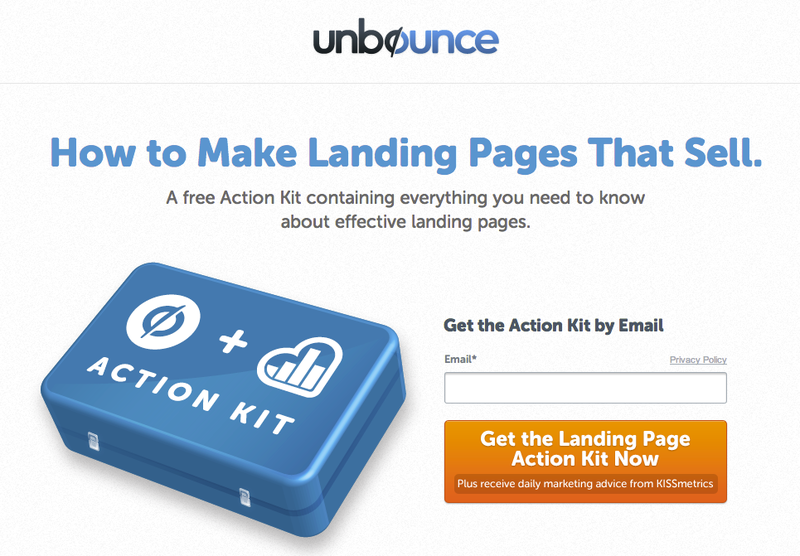 You can also send them to mobile landing pages to avoid building anything. Woah…that was a lot. Thank you for making it to the end. I hope a few of these have inspired you and point you in the right direction to find those difficult first few users. While some of them are paid options, I hope you see how many alternatives there are to paid acquisition on Day 1. There are many, many more ways to find your first users, so let your creativity run wild (like making a fake Vodka brand to launch your events site) and just remember to focus on learning and don’t worry about scaling on Day 1. What are the most clever ways you’ve heard to find your first users? Running a startup puts a ton of responsibilities on your plate. From marketing to sales, ghetto-HR to accounting, development to project management, you’re wearing a million hats. We all know that Lean Startups methodology and customer development are important, but *actually practicing* it can be hard (if you’re not familiar run to CustDev.com *right now* and get Brant and Patrick‘s book The Entrepreneur’s Guide to Customer Development ASAP!). As you commit yourself to “getting outside the building” to talk to your customers and truly quest for Product-Market Fit, it’s essential you make the most of those discussions. One of the hardest things for newcomers to customer development is structuring their questions for customer development, so I’d like share how I structure interviews to maximize their effectiveness. I’m writing a book on Building Customer Driven Products. You can sign up for updates, early access to chapters and help shape the topics I cover by signing up here. A few others have written about how they do interviews, so definitely check out Cindy Alvarez and Sachin Aggarwal’s thoughts on the subject. 1) People – Aka – Who Are You? Before you get into anything about problems or your solution, you need to figure out who you’re actually talking to. This both warms up your interviewee with some softball questions and gives you an opportunity to build some rapport with them. What is your name and role at your company? How do you fit into your company’s department structure? Overall in the company? What is your budget like? Who has to approve your purchases? How do you discover new products for work? Do you need any approval to try them? What is a typical day like on your job? Do not shortchange this opening section of questions! You don’t need a novel on their daily life, but you *do need* enough to be able to understand their role within their company, who key players are and a general baseline of their sophistication. All of this will help you later pattern match who the user type that is most receptive to the problem you’re solving and the solution you offer. 2) Problems – Aka – What are your greatest pains? This section is where you try to find out whether the person has the problem you believe you’re solving. Your goal is to not lead them to your problem. The less you lead them while still hearing your problem being mentioned the more validation you have! What are your top 3 challenges you face in your job? If you could wave a magic wand and instantly have a solution to any of those problems…what would the solution be? People love to talk about themselves, so let them go nuts here and really rant about their problems (i.e.- Shut up and listen!). Generally, people are terrible at proposing solutions, but you want to hear generally what they envision as solutions or see what they’ve cobbled together themselves. Notice, you haven’t mentioned your solution or problem yet. If they don’t mention your problem specifically, then as you finish this section of questioning, you should directly ask them if what you think is a problem is a problem for them. Whether they agree it’s a problem or not, you want to then probe why it wasn’t one of their top problems. If in your discussions in part 2 your problem you think you’re solving comes up naturally from your interviewee you’re on the right track! Bonus points if the way they describe solving it with their “magic wand” remotely resembles what you’re doing. No matter what happens in part 2 you should discuss with them what you thought the problem was and what your solution is. Getting validation that they wouldn’t be interested in the idea is just as helpful as finding out they love it; either they’re not a customer or you are learning what your customers want instead of it. Walk them through the problems you believe your solution solves. Do they agree? Does [your solution] solve any of their problems? If all goes well and you really are solving a pain, then your customer should want access to the product right away. More likely, you’re going to learn a ton about what they do and do not want and your idea will begin evolving. This basic structure can carry you a long way towards some great validated learning about your idea and the market’s desire for it. 1) Take Good Notes or Record Everything! – Once you’ve interviewed 8-10 people, you should be going back over all of your notes and look for patterns. This includes especially looking for patterns in the Part 1 section to see what all the people that agree you are solving their problem have in common. You should summarize your notes then and share with your team. – A good customer development focused company will have everyone involved in the process. Performable, pre-HubSpot acquisition, had their engineers spending 30% of their time on the phone with customers. Nothing helps someone do their job better like understanding who they’re building/selling/marketing for. – It shouldn’t feel like an interview! They should feel like they’re just having a conversation with a friend about their problems at work. The more comfortable they feel with you, the more they will open up. – The best stuff comes when you dig a little deeper on something that strikes a chord in the discussion. The script is there to be your roadmap, but there’s no reason you can’t return to it after a 5 minute digression about a specific pain or discovery about how the company operates. 5) If they’ve made an MVP…ask to see it! – Nothing gives you more insight to a customer than what they’ve hacked together themselves to solve a problem. The best thing you can do is ask to see it, which will give you an idea of what they’re hoping a solution will provide. These people are also the strongest candidates to be great, helpful early adopters of your product. – It’s just common courtesy to thank people for their time and help, but it also opens the door to follow up with them in the future if your product changes and is a fit for them or to invite them to your beta. – Always end your interviews by thanking them and asking them for something. It may be to get a copy of their MVP or even better, ask for an intro to someone they know that might be interested in what you’re working on. In my experience, these intros have an 80-90% success rate in becoming new customer development interviews, whereas cold emails only have a 10% success rate. 8) Be open to new problems! That’s how great products are born. – As Steve Blank has said, “No idea survives first interaction with a customer.” Don’t be afraid to shift your focus from your first idea to what you’re actually hearing customers want. If you probe in part 2 and find a burning problem…find out how they currently solve it and what they’d pay to solve it. In the end, you want to find a “hair on fire” problem, not a “nice to have problem.” Think about it this way: If my hair is on fire (literally), and you’re selling buckets of water, I’m definitely going to buy your product. But if I’m cold and wet, I’m not likely to buy your bucket of water right now, but would consider it in the future. What advice do you have for entrepreneurs doing customer development interviews? What do the Oakland Athletics, Hubspot, the Houston Rockets and LEAN Startups have in common? Thanks to their metrics-progressive GM, Billy Beane, the Oakland Athletics were able to compete annually in the late ’90s with the economic powerhouses of the Yankees and Red Sox, who regularly spent multiple times more money on their player payroll than the Athletics were able to. An innovative team led by Billy more deeply analyzed both the the players and the game itself to discover new ways to compete by defying industry norms. This competitive advantage lasted for years until finally the rest of the league started to catch on and teams like the Red Sox hired GMs who used similar deep, statistical analysis. The old adage for marketing used to be, “half of our marketing is working…I just don’t know which half.” Thanks to the Hubspot tools, small and medium sized business can precisely measure and optimize their inbound marketing process. The advantages of the web are just being realized in many industries. Those that take advantage of them are seeing great results in boosting their sales. 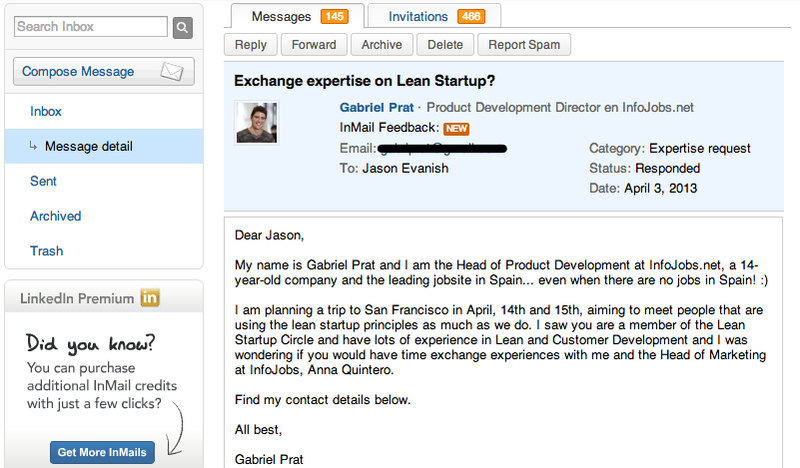 Finally, LEAN Startups is all about measuring your customer. You have to communicate with, analyze and respond to your customer. If you don’t have great metrics, you won’t succeed in creating that great product that people will pay for. How are you measuring your business? How else could you analyze it? You could be missing your next great competitive advantage. Occam’s razor states that the simplest solution is usually the correct one. When you ask the question, “why do most startups fail,” the simple, and often correct answer is, “because of a lack of customers.” The main message of John Prendergast’s session on “Dodging Bullets that Kill Startups” was to focus on your customer as early and as much as possible, so that your business can avoid that common cause of death. John is a disciple of the “LEAN Startups” principles created by Eric Ries, which acted as the basis for the tenants he covered during his session of the unConference. An MVP, or Minimum Viable Product, is the absolute minimum features that would satisfy your customer’s most basic needs. As a LEAN startup, your goal is to quickly and effectively create your MVP, so that you can deliver it to your customers. However, the reason for this is not to drive early revenue; rather, you’re releasing your product at this point in order to learn from your customers. When you release the MVP, you’re accomplishing 2 key goals. First, you’re getting customers to not just talk to you about your product, as you would in market research, but also open their checkbook; you don’t really know anything about your customer until they make the decision that your product is worth paying for. Second, because you and your customer know it is an MVP, they understand it will be improved based on their needs. With this in mind, you will have an open channel to designing the full product they want and will continue to pay for. It is often easy to develop your product in a bubble in your offices or labs. By creating the MVP, you avoid creating a feature intensive, expensive product that doesn’t actually satisfy your customer. At the center of having a LEAN startup is bringing the customer into the development process. This means delivering them the MVP and then having in place the proper communication and metrics to properly assess their responses to the product. You need to ask them, “what are your pain points?” and evaluate their behaviors in using your product. Most customers are ineffective at describing the product they need, because they don’t always know what is at the heart of their problems. By watching their actions and understanding their key obstacles, you can tailor your product to what they need most. In the dotcom era, you often heard about companies growing as quickly as possible in the hopes of gaining immense market share. Given the success rate of those companies, LEAN Startups likely has a point in suggesting that staying small and agile initially is best. When you are small and dealing with only your core customers, you can focus on learning from them and perfecting your product; your burn rate will be lower due to fewer employees, and the smaller customer base will be more manageable for maintaining communication. This harks back to some of the concepts found in the book, Crossing the Chasm. Author Geoffrey Moore suggests using those early adopters, who are anxious to be a part of the development process, to better position your product before reaching the early majority of customers. It is in reaching those early majority customers, which represent significant sales that requires scaling, that creates the “chasm” companies often fall into. In the end, the principles of LEAN Startups is about bringing the scientific method to the business side of the equation. You need to measure everything you’re doing related to your product and understand what works, what doesn’t and what is needed. The only way to know this is to test. If you’re product is a website, that means trying things like an A/B test. If you’re creating a physical product, you need to have customers using it and observe how they use it. Regardless of the product type, you should be giving them short surveys and calling them. As John said, “call God himself if you can get his number!” When you perform these tests you can then evaluate the results and improve and reshape your product; you can add features that are needed, while avoiding mission creep. LEAN Startups is all about your customer. Get them involved and you’re much more likely to create a product that will satisfy and maybe even delight them. Through this process you will also build a personal relationship with them, which is quite likely to improve the chance of continued revenue from them; your product will be exactly what they need and they may even feel some ownership and loyalty to you because of how the product evolved with their input.